In an article published in Forbes, Wes Moss shared his concerns about the financial picture for retirees in America. According to this year’s Retirement Confidence Survey by the Employee Benefits Research Institute, one-third of workers have less than $1,000 saved for retirement. To avoid a gloomy future and retire happily or even early, here are three steps to put you on the right track. Keep in mind, there are many more tips in Wes Moss’s book You Can Retire Sooner Than You Think. However, if you are in your 40s or 50s, you still have plenty of runway left to get on the right track. 1. Happy Retirees Clear Debt. Make a plan to pay off your mortgage as quickly and realistically as possible. Happy retirees typically have their mortgage paid off well before 65, while unhappy ones don’t. 2. Happy Retirees Start Saving Early. Start saving early (or now). Many unhappy retirees delay saving any money until they hit 55, while some never start. A penny saved today is worth a lot more than a penny saved tomorrow. 3. Happy Retirees Spend Wisely. Happy retirees don’t necessarily own McMansions, so don’t feel like you need one, and spend a-third of your paycheck on mortgage. Instead, opt for a more reasonably priced home that requires less than 20% of your monthly income. 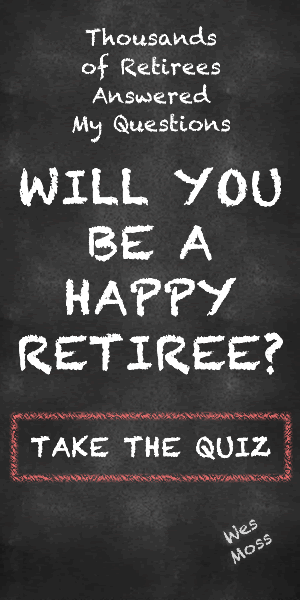 Take the money and happiness quiz on WesMoss.com to quickly learn if you are likely to be a happy retiree. Being happy in retirement is not only about money, but you certainly don’t want to spend your golden years worrying about bills. Make a plan and start saving. This article originally appears in Forbes. Read the original article here.